With new legislation coming into place in April 2019 making tax digital, it is imperative you have a point of reference should you have any queries. Hence, this blog will cover 10 frequently asked questions regarding this issue. If you’re looking for something that may be more specific to your business, you may want to refer to another one of our articles, “Making Tax Digital: How will this change affect my business”. We shall start with the very basic question, “What is Making Tax Digital?”! There’s a lot more than meets the eye when answering this question. In layman’s terms, Making Tax Digital will introduce new rules for businesses with taxable turnover (currently >£85,000). These affected companies will have to keep records in digital form. They will also have to file their VAT returns via Making Tax Digital enabled software. Records don’t have to be contained within one program but must have a digital link between the files. This will ensure that the records are complete and to the HMRC’s required standard. These rules apply to VAT periods starting on or after 1st April 2020. 2. 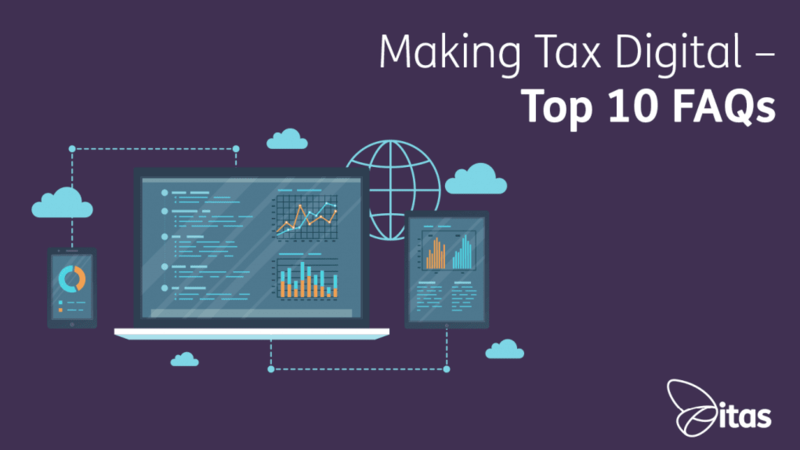 How does Making Tax Digital help me? Making Tax Digital wasn’t just brought in to simplify the tax recording process for the Government. It was brought in to simplify it for business owners too. There are three main reasons for this. Firstly, according to Sage statisticians, using digital software can save 27.6 days a year. This will free up time for you to concentrate on more important matters within your firm. Secondly, Making Tax Digital will provide alerts for firms who are cutting it close on VAT payments. Hence, there is a reduced chance of late filing or payments. Finally, due to the time freed up by the new digitalised system, the firm will become more efficient. Generally, an efficient firm is a profitable firm! 3. What records do I need to keep for Making Tax Digital? For your designatory data, you must keep your business name, address, VAT registration number and VAT schemes used. Each supply you receive, you must record the time of supply, the value of the supply (including any VAT that is not claimable) and the amount of input tax you intend to claim. Each item you supply, you must record the time and value of the supply, along with the rate of VAT charged on the good supplied. Additionally, for your VAT account, you must include your output tax due on sales, tax payable on behalf of your supplier, among a large number of other requirements. For a full list of VAT Account requirements, please refer to this link, and scroll down to “Annex 1 – electronic record-keeping requirements”. 4. Are there plans to streamline reporting for very simple businesses? The option to account for income and expenditure on a ‘cash in, cash out’ basis will be extended to companies with a turnover lower than £150,000. As a result, these businesses will not need to account on an accruals basis. They can instead account based on the difference between money in and out of the firm. This means that these firms only pay tax on income they have already received. This in turn, will promote the use of the statement of cash flows. 5. Are there any exemptions for businesses above the £85,000 threshold? A large majority of firms will be expected to comply with the aforementioned legislation. However, there are a few specific exemptions that will mean your firm will not have to comply. You will not have to comply if your business is run entirely by practising members of a religious society whose beliefs do not allow them to comply (e.g. not allowed to use computers). You don’t have to comply if you are subject to an insolvency procedure or it is not reasonably practical for you to go digital due to age, disability, remoteness of location or any other reason. 6. What should I do if I’m not sure I will reach or surpass the £85,000 threshold? If you are unsure over whether you will meet the £85,000 threshold, make sure you monitor your taxable turnover. You will be required to follow the Making Tax Digital procedure if at the end of any month the value of taxable supplies exceeds over the last 12 months exceeds the registration threshold. Also, if at any time you expect the value of taxable supplies in the next 30 day period alone to go over the registration threshold, you will also be expected to comply with these new standards. 7. Will I have to move to quarterly reporting instead of my annual/monthly routine? Thankfully, you will not have to change your reporting routine to accommodate for Making Tax Digital. If your business operates on a monthly or annual reporting basis, you can maintain your chosen method. This ensures that Making Tax Digital can integrate smoothly with current practices. The purpose of this new scheme is not to create more problems, but solve them! Also, businesses submitting monthly returns can continue to do so, as long as they keep and submit digital records through functional compatible software. 8. What is the official timescale for the Making Tax Digital introduction? The introduction has already begun! Don’t worry though, you’ve got time to sort out everything for the full implementation of Making Tax Digital. The public beta opened in April 2017. In April 2018, all unincorporated businesses with turnover over the £85,000 threshold need to meet the scheme’s requirements. This will be expanded to cover VAT reporting of all unincorporated companies below the threshold but above a new £10,000 threshold in April 2019. Following that in April 2020, corporations with turnover over £10 million will be expected to comply with the scheme. 9. What are the penalties for late submission/payment of VAT? The Government created a consultation document, available here, detailing the 3 plans for sanctioning parties who are required to comply to Making Tax Digital but fail to do so. The first proposal was a “point’s based system”, where you effectively get strikes if you miss a deadline. It’s similar to baseball, but on this occasion, its 4 strikes and you’re out! Penalties will not be given for the first 3 strikes accumulated however on the fourth strike fines will be issued. The second model is a “regular review of compliance”, which would occur annually. The third model is the “suspension of penalties” model. In this model, firms can avoid paying fines via providing late submissions of their VAT returns. 10. Will the Making Tax Digital scheme be used for other forms of taxes in the future? To put it rather bluntly, yes! The Government want to use the current Making Tax Digital scheme as a test run. Once they see how well or poorly the digitisation of VAT returns goes, they intend to fix any issues and move towards a fully digitalised tax system in the near future. There is potential for the digitisation firstly of income and Corporation tax. Following this, they intend to digitise the entire taxation system. Basically, if you don’t know much about the Making Tax Digital scheme, you’re going to want to start learning! There you have it! Our 10 frequently asked questions regarding Making Tax Digital! Please also note, businesses below the £85,000 threshold can waive exemption if they want to follow the Making Tax Digital scheme voluntarily, as the Government encourages the digitisation of this process. If you have any other pressing matters regarding Making Tax Digital, please Contact Us.